Terence Davies tells a story about his accent. The rather plummy, drawling, sonorously toned British voice narrating Of Time and the City is Terence’s. It is distinctive, one that you can imagine reading sonnets on an audio book, or the poetry of Keats. Yet it is not one you hear much in Kensington, the one by Edge Hill rather than that bordering Chelsea. He once asked his sister, “Did I ever have a Liverpool accent?” No, was her response, you have always spoken like the Queen Mother. In my head, his sister barely turns around as she delivers this insouciance. For Terence however, I imagine it characterises much of his relationship with Liverpool; defined by it, embroiled within it, one of the city’s greatest sons. And yet disassociated, independent. If you like a character to be filled with such stark contrasts then come closer, Terence is full of them. Jovial, twinkling yet dark, morose even. Immensely intellectual while also at times simplistic. Emotional, yet some say cold. Not the man, anymore, more the film. And this is the greatest contradiction of them all; Terence makes us feel he is laying himself bare. But has he told us nothing? How much of Terence is on celluloid in his back-catalogue? Is it him, or is it a version of him he wants us to see? Belonging is the sense I am often left with. Being part of and yet not. Living and yet watching. Listen to his stories about growing up on the poor often vicious streets in Kensington. A violent father, a hard-working mother, the youngest of ten children. Painful, emotive and also eulogised. Those streets are turned into a community in Of Time and the City, a canvas on which he weaves his memories. 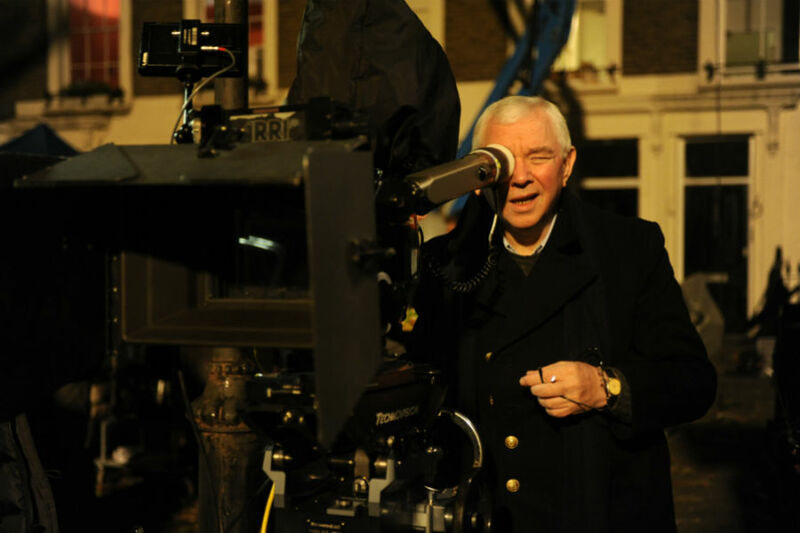 Two things really define the filmmaker Terence Davies, both have to do with churches. A devout catholic, he discovered he was gay. He “prayed until his knees bled” knowing this revelation would cast him asunder from the church that was so part of his culture and ingrained on his life. He is now an atheist. To be cast from your church, your faith, whether by disassociating or by having it done to you must be profoundly painful. Secondly he discovered another faith. This, in the shape of Doris Day, of the Hollywood musicals, was cinema. Liverpool had eight cinemas in town then. Imagine. It is these two events that shape both his films and his relationship with Liverpool. Autobiographical, in depth, highly personal in the Terence Davies Trilogy (Child (1976), Madonna with Child (1980) and Death and Transfiguration (1983)) are brutally insightful and examine his life, faith (and loss of it) and death. His relationships are laid bare. This is a man reflecting back on his childhood in the Liverpool of the forties, a time when men were men, were strong and the stiff upper lip was firmly intact, with deep emotion, ravaged pain and a reflection as cutting as a jagged mirror. No wonder perhaps he felt like he never belonged. Then later, Distant Voices, Still Lives and The Long Day Closes. His Liverpool oeuvre. He would not discuss his hometown again on film until 2008 and Of Time and the City. Perhaps you feel Terence does not fit in because there is no one else really like him. When I interviewed him last year it was on the eve of the filming schedule for Deep Blue Sea. He was enthused, gracious and utterly, utterly charming. For an hour I lived in his world and it was quite, quite wonderful. In the same way his slow dissolves, ability to hold onto a frame, or an expression for a fraction of a second longer than you were expecting. You feel yourself leaning in as his voice drops to a whisper, privy to confidences no one has ever heard before. And can he tell a story? His tale about the struggle he and Hurricane Films – the producers of Of Time and the City – had in sourcing the rights to Peggy Lee’s Fool on the Hill, shown as he talks about the rise of tower blocks in the film, is dramatic. He can hold his audience in the palm of his hand. He does it on celluloid. I’m not even sure if he knows he is doing it. And how Liverpool is that, this ability to tell a tale, to enthuse an audience and win them over? It is what the city’s reputation is built on. Yet five years ago his relationship with the city was over. When Sol Papadopolous and Roy Boulter from Hurricane contacted him about making a film about the city for a 2008 competition called Digital Departures, there seemed a finality in his response: “I have done my Liverpool films”. The door was closed. He had explored his past, his childhood and while the personality and the twinkle might be all scouse, the story on the big screen was over. And what changed his mind? That Peggy Lee song. Driving along embankment he and his manager were listening to the radio when the track came on. Suddenly he was back. He was seeing the tower blocks being built, playing in the rubble of the demolished houses, watching his city change. He began to construct the film in his mind. At that moment Sol rang him, wondering if he had reconsidered. He had. Of Time and the City was made in less than a year. Wowing critics and independent film lovers alike, it is, I think, one of the most startling autobiographical poems committed to film. Perhaps he had thought everything about his city had been said. Perhaps he just needed to tell the story in a different medium. Perhaps he just needed to be older. Terence says Hurricane revived his film career. If you think House of Mirth was a decade ago then to release two films in three years and be in talks about a third suggests he is becoming almost prolific. Yet there is a change. While Terence’s early Liverpool films are poetic, they are also dark and bleak. Distant Voices is masterful but unrelenting. It captures one feeling. Poverty has destroyed this man. It is hopeless and angry. Vicious. Instead of capturing one sense or one feeling, Of Time and the City takes us on a much wider journey. I once described it as a Terence Davies fairground ride. It is less, resentful, somehow. A man more at ease. It is not our city Terence Davies shows us. It is his. Similarly he is not ours, simply because he is from here and he talks about us. He belongs to us and yet he doesn’t, like the tom cat, stretching out in front of the hearth in the evening and tantalising us with hard earned affection, but the following morning he is out again, roaming the streets, king of his domain. The crumbling streets of Kensington he grew up in and painted on the big screen may be unrecognisable by his neighbours, but they are unashamedly him. And that is Terence Davies, a man without compromise.